You can check the number of active users currently logged into the application using the following query. Also you can check the number of user session for the application using ICX_SESSIONS table. Use below query for checking the number of user sessions. 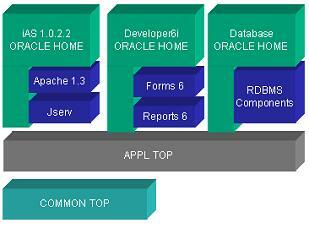 There has been a specific directory structure and file structure that is followed in Oracle application. In the previous release till 11iCU2, there was some standard naming convention that is following. Each directory whether it’s a product top or form directory was having an organized path. 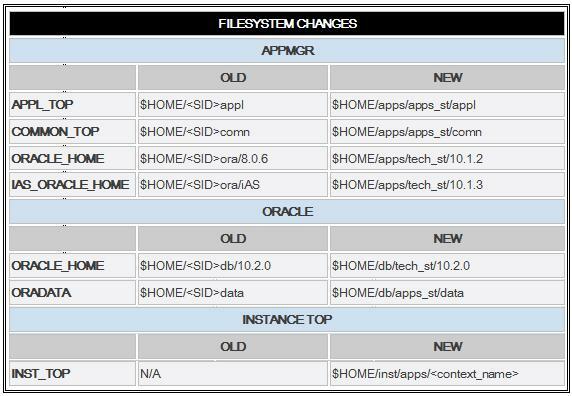 In the new oracle application release, E-Business suite R12, the file directory structure is changed. This doesn’t mean that there is no specific organization of files and directory. Off course the pattern for directories and file system is organized well, but it is different then the directory structure for the previous releases. In this post we will check the changes in the directory structure organization and also the techstack level changes. In many cases, configuration changes more frequently than code and data. So keeping it separately would result in easy maintenance. Also, in a shared file system, MUTEX files, related to Apache, cause access related problems as IAS_ORACLE_HOME is mounted on NFS. With the new file structure, this issue is also resolved as all the configuration files can be stored on the local server instead of NFS. Other then this there is one more directory at this level (INST). This is instance directory. We have a new environment variable in R12 called as INST_TOP, which points in this directory. The directory structure for apps11i is also shown. Here we have 3 top directory under HOME directory. 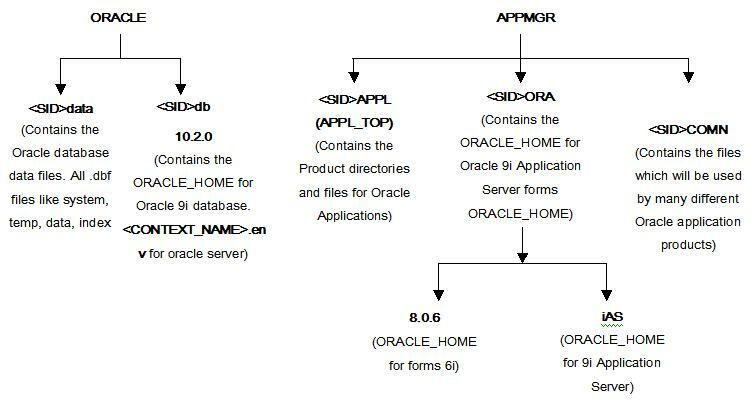 These are <SID>appl (APPL_TOP as discussed previously), <SID>comn (COMMON_TOP) and <SID>ora (IAS_ORACLE_HOME for 9i Application server and forms ORACLE_HOME). 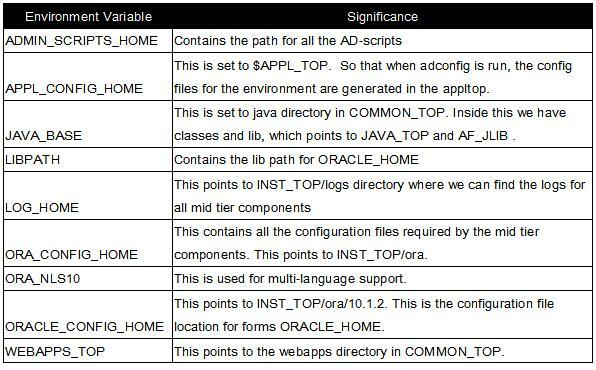 Inside <SID>ora directory we have 8.0.6 directory, which is the ORACLE_HOME for forms, and iAS directory which is ORACLE_HOME for 9i Application server. 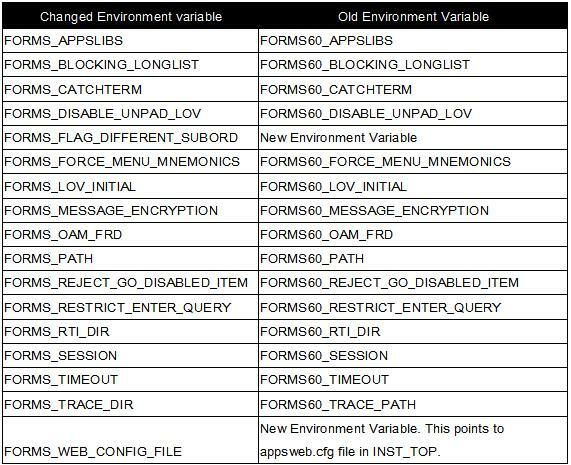 The database side consists of the base oracle directory, similar to appmgr directory. Inside oracle directory again we have the distinction of technology directory with data directory. We have APPS_ST and TECH_ST directories. 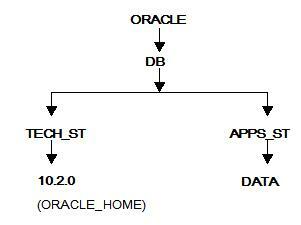 APPS_ST contains data files for the database and TECH_ST is the ORACLE_HOME for oracle database 10g. Here we will be comparing the major directory structure changes that happened between the old and new release. In case of 11i release the JAVA_TOP was pointing to COMMON_TOP / java directory, which consist of class and archive directories. The class directory consist of all the .class files where as archive directory consist of all jar files. In R12 this has been changed and new JAVA_TOP directly points to COMMON_TOP / java / classes directory, which contains all .class files. For jar files we have another directory called lib. This contains JAR files. For pointing to this directory, there is another environment variable that is defined called AF_JLIB. 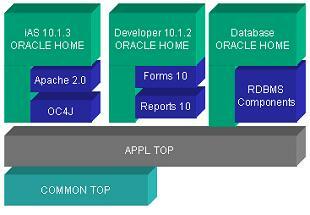 For Oracle Apps 11i we have following components version. In R12 the components and versions are as given below. In case of new techstack some of the components got changed. Following is the brief comparison. In case of 11i, Jserv engine was part of HTTP server and was used for JSP and Java requests. This has been replaced by OACORE (for handling JSP). Instead of Application server 9i used in 11i, in R12 we have Application server 10g. Instance top contains all the config files, log files, ssl certificates, document root etc. This is a new directory introduced in R12TS. Addition of this directory makes the middle-tier more organized, since data is kept separate from config/log files. Another advantage is that, multiple instances can easily share the same middle tier / DB. To create a new instance that shares an existing middle-tier, just create a new instance_top with proper config files and nfs mount the middle tier in the server. In 11i release all the config/log files was in COMMON_TOP. This has been shifted to INST_TOP. This is just to organize the application middle tire and to make a distinction between the core files and config/log files. Before checking the contents of INST_TOP, lets have a brief comparison of what was the content of COMMON_TOP in 11i release and R12. COMMON_TOP contains following directories. 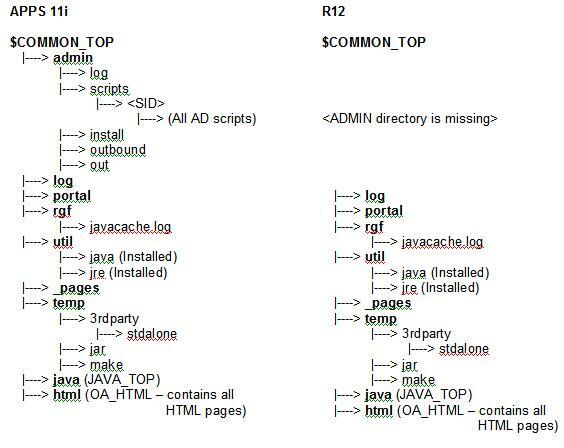 So if we see the above comparison for the COMMON_TOP for 11i and R12, we see that there is only one directory, which is missing. This directory is admin directory. This directory is been shifted to INST_TOP. Also the log directory, which is still shown in COMMON_TOP, is no more used. 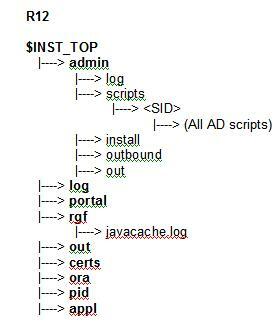 There is another log directory in INST_TOP. This represents the logs for all the components of middle tier. Lets now see the structure of INST_TOP. Here we see that we have some of the directories, which are same as directories in COMMON_TOP. So lets clear the confusion here as to which directory in which TOP is used for what purpose. Actually the LOG, PORTAL and RGF directory in COMMON_TOP is not used. Instead these directories in INST_TOP are actually used. They are just the copies stored in COMMON_TOP. Also the admin directory is clearly moved to INST_TOP. LOG directory contains the log files for all the components of mid tier like apache, oacore, opmn, and concurrent manager and also the logs for the AD-scripts used to manager various services. CERTS directory is used for SSL certificates. In case of secured environment where secure certificates are used, the certificates should be downloaded in this directory. PID directory contains the PID (process ID) for middle tier processes like apache. APPL directory contains the 2 directories admin and fnd. ADMIN directory contains ojspCompile.conf and ojspCompile.properties. These files are important for JSP compilation and settings. FND directory contains the DBC file, which is required by the middle tier to connect to database. Actually the DBC file which used to be in $FND_TOP/secure directory location in the 11i release has been shifted to this location. This location is directly referred by an environment variable FND_SECURE. This was pointing to $FND_TOP/secure directory in 11i release. In R12 its pointing to $INST_TOP/appl/fnd/secure directory. 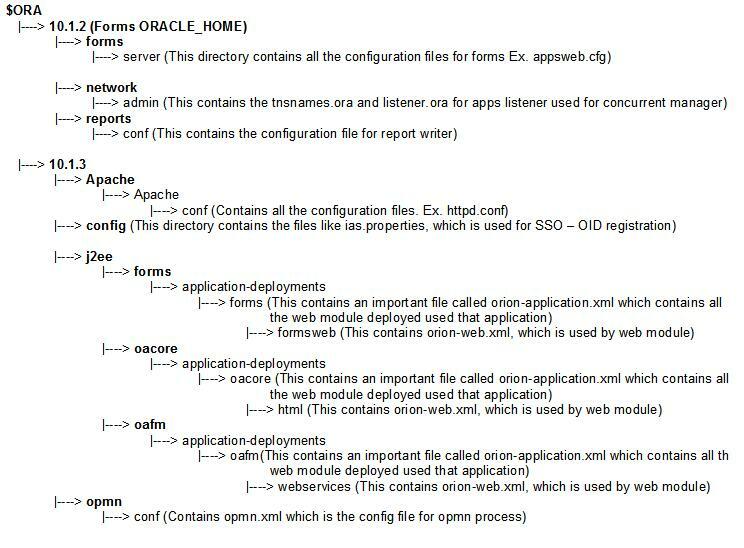 ORA directory indicated the techstack components. But an ORA directory in INST_TOP contains the configuration information of the techstack components. Lets look into the details of this directory. 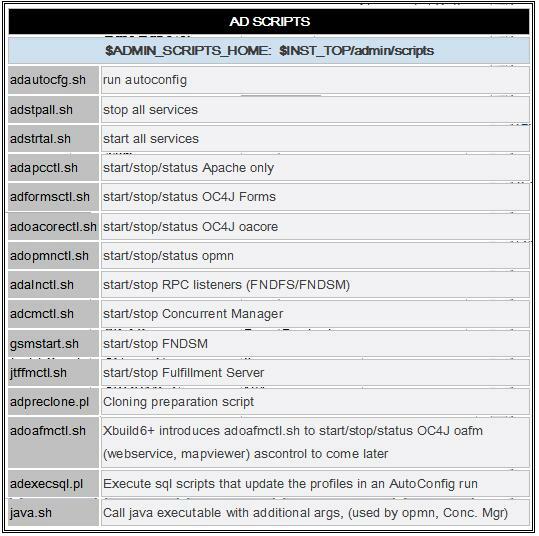 ADMIN directory contains all the AD-scripts used to manage the middle tier components. ADMIN directory contains the SCRIPT directory, which has all the script. Actually these are the wrapper scripts over the main binary. We will see the details of these scripts when we explain each component. Following are the different AD-scripts and there function. Hope this information will be helpful !! Thanks. This section will cover the detailed steps required for cloning an 11i instance. Cloning an instance is creating a duplicate of the instance. But this definition is not exactly true, because during cloning we change various details like hostname, SID etc and configure the system as per these new values. But if we see the application data and other techstack versions are exactly same as source instance. Some time situations arise where we have to clone our application system. For example, if we have a production instance and we want to create a test instance or a debug instance, then in that case we can just make a duplicate of production instance by cloning. Test instance is usually used when we want to test some patches before applying into production so as to avoid any unknown downtime for production system. Also some times we face issues in production and we want to reproduce the same error in test and get it fixed in test. Such kind of situations demands test instance. My environment is 11.5.10.CU2. Database version is 9.2.0.6. 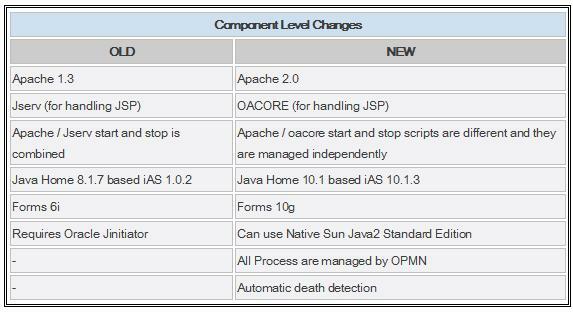 OA Framework Version InformationOA Framework Version 11.5.10.2CU. There are 2 major methods for cloning an application system. 1) Cloning Oracle application without rapid clone. Cloning Oracle Applications Release 11i was originally published in conjunction with Release 11.5.5 and is applicable for all 11i releases up to 11.5.5 that are not AutoConfig enabled. Cloning Oracle Applications Release 11i with Rapid Clone is applicable for all 11i systems that have migrated to AutoConfig and enabled Rapid Clone. This method contains steps to install AutoConfig and Rapid Clone. Rapid Clone is the new cloning utility introduced in Release 11.5.8. Rapid Clone leverages the new installation and configuration technology utilized by Rapid Install. See OracleMetaLink Note 230672.1 (Cloning Oracle Applications 11i with Rapid Clone) for instructions on installing and enabling Rapid Clone. Also there is one more method for cloning Oracle application with autoconfig, but this has been fully replaced by Cloning Oracle application using Rapidclone technology and is no longer supported by Oracle. We will first discuss the method for cloning an Oracle Application with rapidclone. Cloning the application system using rapid clone involves 3 major steps. Preparing The source file system actually contains 2 sub steps. Preparing the source system for cloning. We will start with checking the pre-requisites for cloning. 1) Make sure that patch 2115451 is applied to the application system. This will create the neccessary perl script. In our case the version of application is 11.5.10CU2, so this patch was already applied. 2) Apply the latest AD Minipack (Apply patch 4712852 (AD.I.4) or higher). Check the current AD level of your application. 3) Apply the latest Autoconfig patch to the application. As per the note ID 165195.1 the latest patch for autoconfig is 5985992(JUL/AUG 2007). Please carry out the post install steps properly as mentioned in the README.txt present in the patch directory. Third patch is required only if the application is on SLES linux. 5) Run Autoconfig on Application tier as well as on database tier. Make sure you did not encounter any error. Completing till this step concludes that this environment can be now rapid cloned. We have all latest AD patches and autoconfig patches applied to the environment and also we have all latest rapid clone patches applied to the environment. Now next step is the actual preparation step for cloning the instance. Stay tuned !! In this step we will prepare the source file system for cloning. This involves gathering the required configuration information. In a broad way this step will create the staged clone directory which will be having the driver files and configuration file of the source. 6) According to metalink note ID 230672.1, preparing the source system consists of preparing the database side and preparing the appltop side. We need to run adpreclone.pl script on both database side and appltop side. Lets check the details. 6a) Running adpreclone on database side. When we run this command on the database side following things happens. “db” will contain the techstack information, “data” will contain the information related to datafiles and required for cloning. Once the application system is prepared for cloning. Next thing that you have to do is to bring down database and listener as well (complete application system is down) and copy the whole application to the location, where you want to create a clone. You need to copy the following components. Once all the copy is done on the target system, you can start your source application system for normal use. Target system can be configured as given below. This will use the templates and driver files those where created while running adpreclone.pl on source system and has been copied to target system. adchkutl.sh — This will check the system for ld, ar, cc, and make versions. adclonectx.pl — This will clone the context file. Because when we copy the application files from source system to target system, we also copy the context file. But this context file wont be of use here. So we need to create a new context file as per the details of this instance. Here hostname, ports and other details will change. At the end it will run the driver file $COMMON_TOP/clone/appl/driver/appl.drv and then runs autoconfig. Redo log files are written by redo log writter process. The files are written in Oracle proprietary format and cannot be read directly. However there are simple command for reading the logfile. I had a situation where I wanted to read the blocks of online redo log files. I was knowing the commands to read datafile blocks by giving the file number and block numbers, but it took me lot of time to actually search the command for redo log files. Anyway after speding some time, I come to know some of the ways we can dump the content of redo log files. We basically dump the output of redo log files in a trace and then read the trace file to understand the content. Below are some of the useful command. This will cause all the changes to the specified range of data blocks to be dumped to the trace file. In the example given, all redo records for file #5, blocks 31125 thru 31150 are dumped. This will dump all redo records for the range of redo addresses specified for the given sequence number and block number. Using this option will cause redo records created within the time range specified to be dumped to the trace file. This will dump file header information for every online redo log file. Please note: Fully qualify the filename, and include the single quotes.